Industrial mixers and regular mixers don’t have the same features and functions. If you’re going to run a business, industrial mixers are better options because they’re designed with heavy-duty hardware that’s built for daily prep tasks. At most commercial supply stores, you’ll find dozens of mixers for industrial use by many brands, and most units will have a specific design. If you pick a design that suits your routines, you’ll complete all preparation tasks effectively and efficiently. A mixer that’s designed with a base holds a bowl. This particular mixer fits on a counter or table in a commercial kitchen. Along the top of the unit, you’ll find buttons that control mixing speeds and a docking area for mixing attachments and accessories. Near the center of the neck, you may find a mechanism that tilts the mixer up. This feature makes the process detaching and attaching mixing paddles easier. You can use this type of mixer during preparation jobs that involve desserts. Because this mixer has a deep, wide bowl, it can combine sugar, flour, salt, and other ingredients without spilling anything. Whenever you need to mix large batches of food in huge buckets, an electric-powered mixer on a pole can help you mix everything evenly. This product has a shaft that’s very long, so you can submerge the mixing blades to the bottom of a bucket in order to mix all ingredients thoroughly. Thick, dense soups and seasonings won’t slow down this type of industrial mixer because it has a powerful motor. 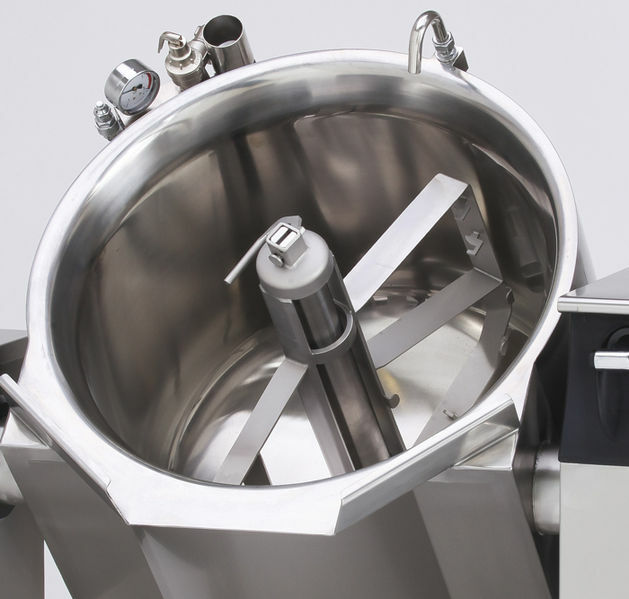 These mixers are designed for restaurants, factories, and manufacturing plants. If you invest in both options, you’ll have great equipment for a variety of mixing routines.